Hibernal weather conditions curtailed action in Dublin this week. An Armageddon-lite terrain meant that as well as having to dodge snowballs and endure wet feet, Dubliners missed out on many events that had been scheduled. The Crash Ensemble didn't escape the disruption. With two dates of its national Stranger Folk tour having been cancelled, the group also had to arrange a last-minute change of venue for the Dublin date. Luckily, the group's old haunt the O'Reilly Theatre was available for the purpose. Following the venue change and weather, the corresponding audience wasn't overbig; but those who did brave the cold were rewarded with a laid back and warming evening of music, featuring works from diverse areas of the globe to satisfy any want of escapism. Under the confident baton of Alan Pierson, artistic director of Alarm Will Sound, Crash gave steady readings of music that on the whole wasn't hugely challenging, either for the performers or for the ears. Considering, though, that this series of concerts wraps up a year that saw the group succesfully perform in the US and the UK, some resting on laurels was excusable. The Stranger Folk theme of the series sees a number of works programmed all expressing the influence of folk music in some way – or ostensibly so at least, since a couple of the works aren't accounted for in this way at all. Dutch 'avant pop' composer JacobTV arrived at savant composition by way of a background in rock music. Much of his work mixes orthodox classical instrumentation with uncommon elements, for example pairing ensemble with audio samples from television and other media. While there is some element of subversion at work it isn't anything dangerous, and the composer's claim that he is 'still an outlaw in the established musical scene' is wishful. Still, even if it isn't as violent as it likes to think it is, the music is entertaining. Jesus is Coming pits ensemble with religion-baiting samples, coming across like a live music box. There is a plunderphonics aspect to the compositional style that isn't much heard in Ireland, paired with a tonal post-minimalist discourse that is over-familiar. After this piece the artistic director of Crash, Donnacha Dennehy, came onstage to present the night's programme, thanking the O'Reilly Theatre for accommodating the concert at short notice. Gerald Barry's music is not known for its measuredness and serenity, but that's what was projected in First Sorrow for string quartet. Written a few years ago for Crash, the work alludes to a story by Kafka about an acrobat whose day-to-day life is lived at the zenith of the trapeze, and who never wants to descend from that point. In duos the strings describe stately pianissimo lines, changing from one pair of players to another, the music delivered senza vibrato, sometimes in unison doubling. After ten minutes the piece briefly flares before lulling again. The four strings then sing a nursery rhyme together while playing out – Twinkle, Twinkle, Little Star. Wrapping up the first half was a recent work by Donnacha Dennehy, As an Nós. The title refers in Irish to habit, repetition and release, and the work is based on the alterations and continuations of a minor theme. Following attacks on piano and winds, 7/4 ripples eddy around the ensemble. Glockenspiel cuts through the group lending wintry pathos. Memories were dispelled in this listener's mind of musical forms past, in particular theme and variations: instant variation of a theme, a theme occurring only through instant variation. After a compelling first half of the concert the second half failed to deliver. Jewish-American composer John Zorn's Paran opened things, as it had at Crash's last concert in Dublin. Its plodding tread sees trite nostalgia killing the possibility of a more artful interrogation of klezmer heritage. A Jewish theme also pervades The Dreams and Prayers of Isaac the Blind, by Argentinean composer Osvaldo Golijov. An augmented string quartet, stood in a circle facing each other, rehearse music with a heavy Jewish folk influence. The results, again, came across as conservative and insipid. Although Crash consistently delivers up-to-date music, it would be nice to hear more challenging fare occasionally offered. 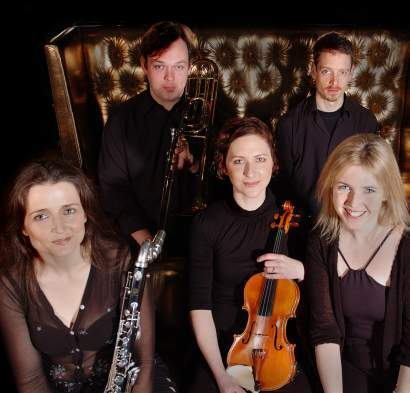 Post-minimalist, neo-romantic and neo-tonal music is well and good but surely there is more interesting and more innovative music that could be presented to the Irish concert-going public – the spectral school, for example, or any of the European composers featuring on the Kairos label. The most compelling work of the second half was John Godfrey's The Abstract Despotisms of Calculus. The audience was invited to rise and wander around the auditorium to capture the fluctuations imposed on the music's acoustic character by the dimensions of the performance space. The piece is comprised of low sine tone drones and electro-acoustic drones from the ensemble. For the most part the sonic variations were negligible, but it was nice to be mobile within the auditory space of the venue, observing the faces of other audience members as they toured about.